Surging demand for data services and mobile broadband deployment continues to be a major growth driver for the telecom industry. In 2017, LTE became the #1 most commonly used wireless cellular technology, globally. And while 4G already provides wireless access for many services and applications (such as voice and video calls, internet connectivity, IPTV), to many consumers globally, it will only continue to increase over the next few years. LTE usage is forecasted to grow exponentially over the next few years. To launch an LTE network, you could use an Evolved Packet Core (EPC) from our technology partners such as Huawei, ZTE, Alcatel-Lucent, Aricent or Adax, or use an easy-to-develop plugin for HSS provisioning for a quick integration with another core network vendor. is used to configure service parameters and acts as a central repository of customer data. A SIM card inventory allows management and activation of SIM cards. Every change in B/OSS (e.g. new customer activation) is instantaneously provisioned to HSS and other network elements such as PCRF. B/OSS handles product catalog and consolidated customer balance management, provides credit card payments and top-up voucher inventory, applies recurrent charging, issues invoices, and allows staff to perform monitoring & troubleshooting. allows real-time charging for activity such as data sessions, voice calls or SMS. PortaBilling is a flexible LTE OCS solution that offers various options for quota management, allows an unlimited number of service wallets, and enables location and content-based charging. PortaBilling also enables LTE data bundle control. is where the actual packet switching and session management take place. It typically includes at least HSS (Home Subscriber Server), MME (Mobile Management Entity), SAE-GW and PCRF. You may use EPC from existing technology partners. 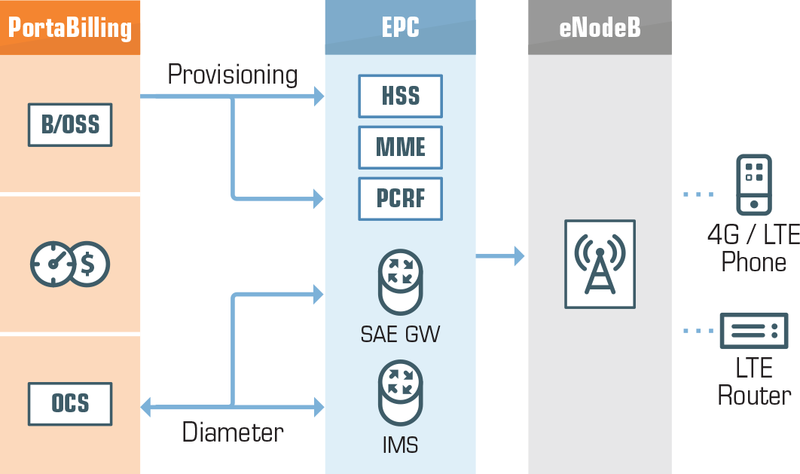 Alternatively, PortaBilling supports the Diameter Gy standard for LTE/IMS authorization and LTE real-time charging and allows easy plugin development for HSS provisioning, so integration with a new vendor can be accomplished in just a week or two. handles the actual radio part of the communication. Because of the level of abstraction introduced by 3GPP/IMS, you have full freedom of choice between eNodeB platforms/vendors, without any effect on B/OSS and charging. Roll out your radio access network (E-UTRAN) consisting of eNodeB (base-stations) to provide adequate radio coverage for the desired region. Install EPC in your data center. PortaBilling B/OSS is typically installed in the same location. Using the PortaBilling admin web GUI, import a list of your SIM cards into the SIM card inventory, and the available MSISDN into the DID inventory. Then activate real-time service provisioning in HSS and PCRF (if necessary). Create your service catalog in PortaBilling. This enables services for subscribers (such as LTE data access, Wi-Fi, VoIP, or VoLTE), assigns rating methods (e.g. charging based on the total time connected or the total data transferred) and defines auxiliary service parameters, such as the maximum allowed bandwidth during peak hours. Additional services (e.g. OTT VoIP calling). You may also create a set of add-on products (e.g. additional 10GB of data per month), which your customers can order “à la carte” using the self-care portal. Optionally, create a network of resellers (with an unlimited number of sub-reseller levels) and distributors. Provision your customers in PortaBilling, assigning to each a SIM card and the desired product combination. The service is activated in HSS nearly instantaneously, and the customer is ready to register on the network. Once the customer session starts, SAE-GW performs real-time authorization in PortaBilling using Diameter Gy. This reserves funds/resources for the next session (e.g. 100MB of data). Once the allotted quota is depleted, another authorization will be sent. This allows multiple sessions/services (e.g. a VoIP call on top of an LTE data session) with zero risk of a balance overdraft. If the funds on a customer’s accounts are depleted, he is hotlined, i.e. redirected to the self-care portal, where his balance can be topped up. On the self-care portal, customers can check their statistics, change their service configuration, order additional add-on products, transfer funds to a service wallet, do a voucher top-up, or make payment using a credit card. At the end of the month, a PDF invoice is generated and emailed to postpaid customers. If a customer is suspended because of late payment, the service is automatically deactivated in HSS. Ti Lian Seng, CTO at Packet One Networks (Malaysia) Sdn Bhd.